San Luis Reservoir, just west of the San Joaquin Valley town of Los Banos, is one of California’s key water facilities. Pumps in the Sacramento-San Joaquin Delta ship water down two massive canals — the state-owned California Aqueduct and the federal Delta-Mendota Canal — to a holding basin, or forebay, adjacent to the reservoir. From there, another set of pumps lifts water into the reservoir, where it’s stored before being pumped again for delivery to farm and city customers farther south. All reservoirs are artificial creations, but there’s an extra dimension of artificiality here: There’s virtually no natural inflow to the reservoir; it exists only to receive the water pouring down two huge manufactured rivers. 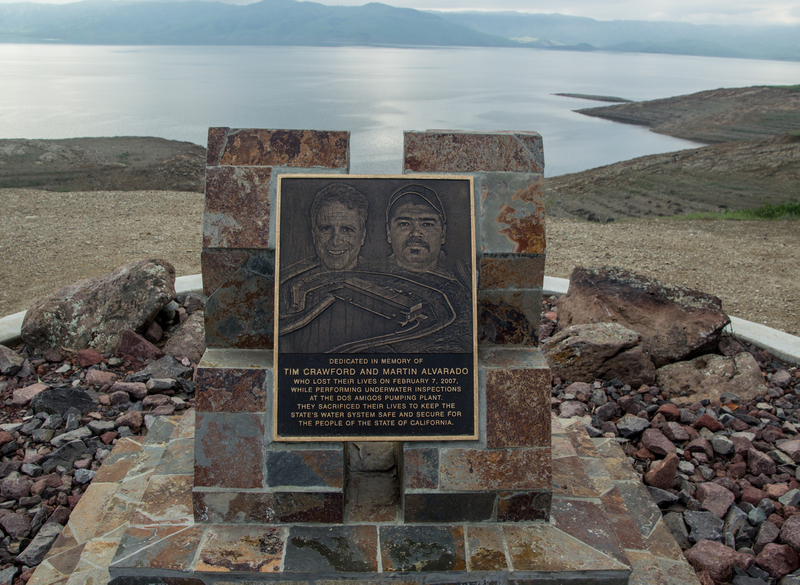 Memorial plaque at San Luis Reservoir to two Department of Water Resources divers who died in a 2007 incident at a nearby pumping plant. The wording is curious. These two men “sacrificed their lives to keep the state’s water supply safe and secure”? It sounds heroic. What happened? I had no idea. But armed with the two names, it’s easy to find out. The two divers went into the water to inspect “trash racks” just upstream of the pumps at the Dos Amigos Pumping Plant, apparently looking for invasive mussels. Five of the six pumps at the facility were shut down, and one was running full bore. Somehow the divers wound up near the operating pump. The powerful current there pulled them in and pinned them against the trash rack, a huge steel grate designed to stop large debris from going through the pump. The untrained fellow Department of Water Resources employee who had been given the job of “tending” the dive soon lost sight of the divers’ bubbles, his only means of tracking the men, but had no idea what to do. By the time he thought to alert anyone in the pumping plant, the divers were probably out of air. 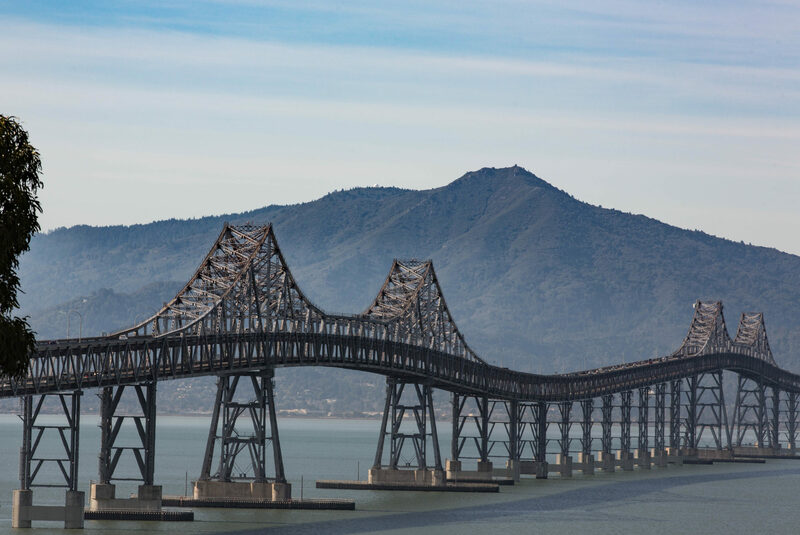 It took more than an hour after trouble was detected to shut down the operating pump, and another 35 minutes after that before a recovery diver was in the water. Both divers were found at the bottom of the aqueduct, drowned. Subsequent investigations found a series of missteps, including some by the divers themselves, that contributed to the outcome. I get the human impulse behind injecting a note of heroism into the plaque’s language. We want to find something to redeem such awful deaths, to give the sacrifice a purpose. But it might have been more to the point, and a more fitting memorial, to say something like: “Dedicated in hopes that their deaths might serve to prevent future tragedies.” A message like that might serve as a living reminder to those responsible for preventing incidents that they must remain vigilant. To read more: Here’s the Department of Water Resources report on the incident. Dive tender: How long these guys stay down? You know? And finally: a DWR memorial publication to the two divers (see pages 5 through 7).